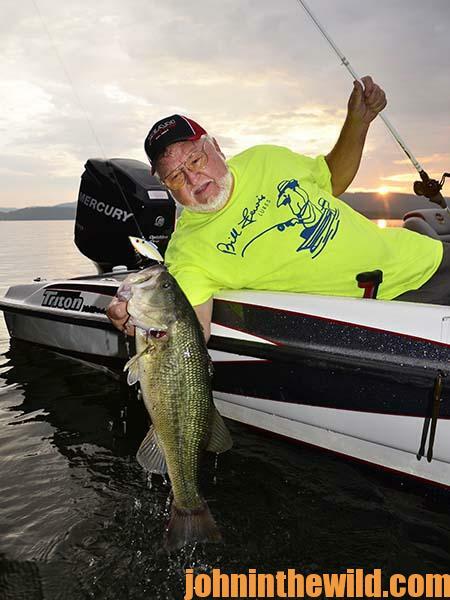 John’s Note: Captain Phillip Criss of Scottsboro, Alabama, has been a more than two decade fishing buddy of mine for both bass and crappie – first at Miller’s Ferry and now at Lake Guntersville (www.guntersvilleal.org) on the Tennessee River in north Alabama. 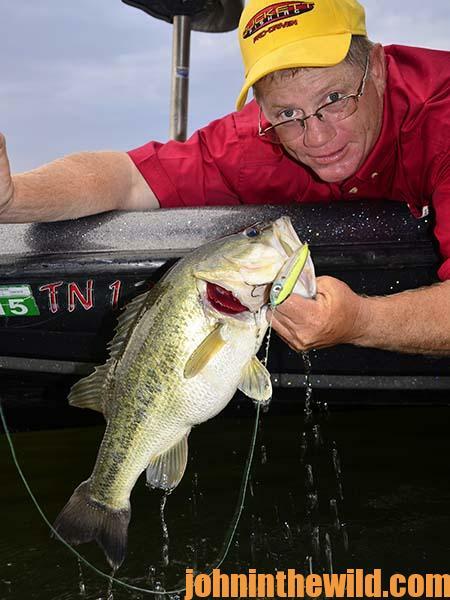 Anglers across the South know of Criss’s bass fishing expertise, and since he retired from his day job to Guntersville to guide and fish, I’ve wanted to go fishing with him. In mid-July, I finally had the chance. “I fish a Spro Little John deep-diving crankbait (http://http://www.spro.com) that dives down to 16 to 20 feet deep, and I like the nasty shad color,” Phillip Criss reports. The other color he fishes with this crankbait is Cell Mate. When Criss is fishing the Little John, he casts it as far as he can, cranks the bait down hard and tries to dig the lip of the crankbait into the bottom. While Criss was explaining to me how to fish this deep-diving crankbait, I still was fishing the Zoom Magnum Trick Worm (www.zoombait.com) when I felt the worm crawl into a brush pile and hang up. I shook the bait, jerked it, pulled on the line and finally got the shaky head out of the brush. 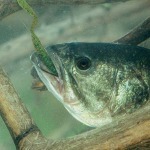 Immediately the worm fell, and a 5 pound largemouth attacked. We landed the bass and put it in the live well. 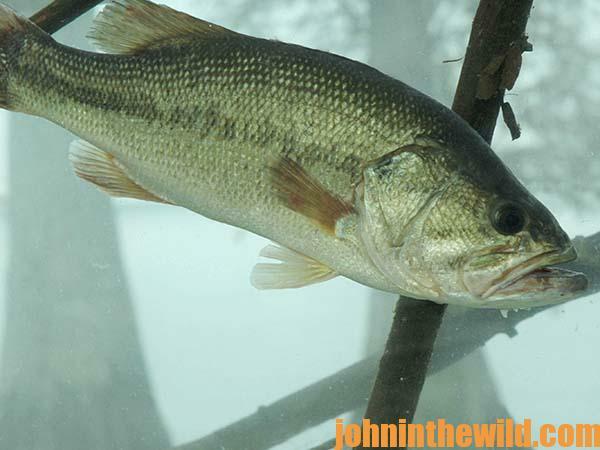 The first afternoon I fished with Criss we were in and out of little rainstorms, but the bass came up schooling. 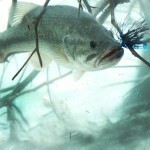 I couldn’t believe the size of some of the schooling bass I saw chasing and eating shad. 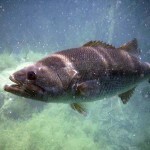 I spotted one bass that had to weigh from 7 to 10 pounds and had a 10- to 12-inch shad folded in half in its mouth. That big bass was trying to close its mouth and eat that whole big shad. When we released the first 6-pounder I had caught, that fish spit out a shad that was 10-inches long. 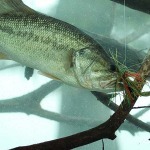 Most of the time, when I’ve seen bass schooling on shad, the bass will weigh from 1/2- to maybe 3 to 5 pounds. But on Lake Guntersville, when those really big bass come up in schools, you can see bass with heads that look like a #1 washtub. A relatively-new swimbait that I plan to investigate more fully is the Bull Shad, a 9-inch swimbait that has a hefty price tag of $79.99 (www.bullshad.com). 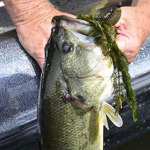 From the reports I’ve gathered on the lake, many bass fishermen say that the price is justified by the number of big bass the Bull Shad swimbait is producing, but I know nothing but hearsay evidence. Criss told me that most stores around Guntersville can hardly keep it in stock. I hope to report more details on this giant swimbait, when I’ve had a chance to fish it.